Coats can be a fashion statement even when the inclement weather tries to hard your natural style. For autumn and winter the right fit and fabric of a winter coat makes all the difference between warm yet attractive and feeling as though you are dressing a snowman! 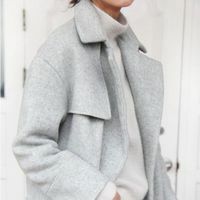 Fuzzy coat styles that are hot this year include faux fur and textiles such as cashmere and other spins of goat and sheep wool. A parka is not out of place when ice is on the ground, while a pea coat can be cute and comfortable. If you are looking for a mens coat or trench coat, consider the denim look - something different.